Cover tape is used to seal devices into carrier tape pockets. Cover tape is sealed on the surface of the carrier tape, either by heat or pressure, and secures the device within the carrier tape pocket. When presented to a pick and place machine, the cover tape is removed in order to present the device to the picking head ready for placing onto the printed circuit board. 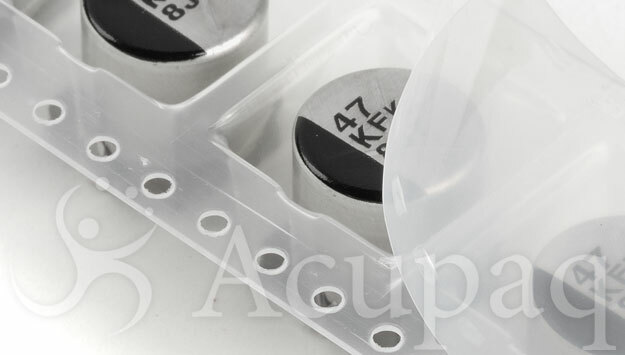 At this time, Acupaq offers ABx (heat seal, anti-static), PS (pressure seal, anti-static) and NS (heat seal). These tape & reel cover tapes are available in most industry standard widths, and are tested to with all carrier tape materials, including swiftTape. Acupaq stock an extensive range of carrier tape, and these are available from over 30 global stocking locations.